Drifters Casing Service is committed to providing a safe work environment for its employees, clients and other work personnel present at the work site. We are affiliated with ISNetworld, Complyworks, Enform-Secor, and have an Alberta Safety Fitness Certificate. Contact us at our 24-hour Grande Prairie Dispatch. WANT TO KNOW MORE? EMAIL US. 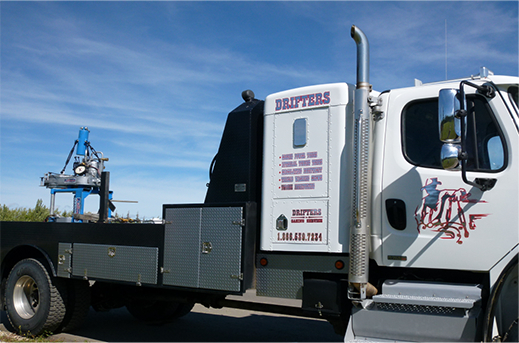 Drifters Casing Service is a locally owned and independent oilfield service company operating out of Grande Prairie, Alberta since 2000. Our primary focus is Power Tongs, Integral tubing tongs and WinCatt Computer Torque Monitoring along with all associated handling equipment for casing and tubing from 2 3/8" to 13 3/8". We also provide thread washing and thread inspection and have a wide variety of equipment and trucks to service the seasonal changes in the oilfield.